Important discoveries in Egyptology including the Rosetta Stone and tomb of Tutankhamun. Discover how Egyptologists deciphered the Rosetta Stone. Ancient Egypt’s history from its origins as a group of settlements along the banks of the Nile, its rise to one of the world’s greatest civilisations to its decline at the hands of the Roman Empire. Illustrated with stunning photographs, artwork, diagrams and cutaways. Includes a comprehensive factfinder featuring a time chart, a list of who’s who and details of recent archaeological finds. With internet links to recommended websites with further information, video clips and virtual tours. The encyclopedia is full of stunning photographs and detailed illustrations. It also has a comprehensive factfinder featuring a time chart, a list of who's who and details of recent archaeological finds. Internet links offer a selection of recommended related websites, with sound, animation or video clips that provide additional information for projects and homework. 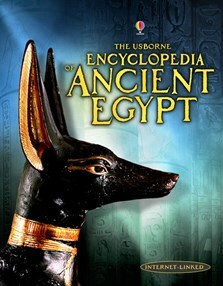 It forms part of Usborne's excellent ancient history range for children. A stunningly illustrated and presented book, which is deserving of a place on any bookshelf... includes a comprehensive factfinder featuring a time chart, a list of who's who and details of recent archaeological finds, showing there is still much to learn and discover. I thought this book was incredibly interesting as I especially enjoyed the part in the Early Egypt section where it says 'The Predynastic Period' with the picture of the terracotta dancing lady. I also liked the part about the two crowns as I never knew that upper Egypt and lower Egypt had different coloured crowns. Since I first started to read this book I can't stop reading it! I'm going to become a book worm if you bring out any more books like that one! So PPLLEEAASSEE bring out another one!